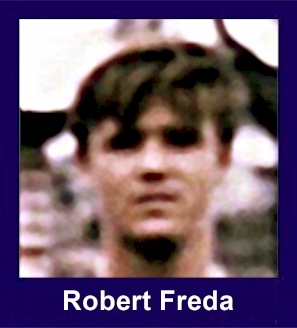 The 35th Infantry Regiment Association salutes our fallen brother, PFC Robert Freda, who died in the service of his country on September 14th, 1970 in Phu Yen Province, Vietnam. The cause of death was listed as Small Arms/AW. At the time of his death Robert was 21 years of age. He was from Miami, Florida. Robert is honored on the Vietnam Veterans Memorial at Panel 07W, Line 63. The decorations earned by PFC Robert Freda include: the Combat Infantryman Badge, the Bronze Star, the Purple Heart, the National Defense Service Medal, the Vietnam Service Medal, the Vietnam Campaign Medal and the Vietnam Cross of Gallantry with Palm Unit Citation. Rosary services will be Friday for Army Pfc. Robert Freda, 21, of 415 NE 131st St., who was killed in Vietnam Sept 14. Pfc. Freda born in New Jersey, graduated from North Miami High School in 1969. He was drafted March 9 and left for service in Vietnam in August. Eight days before his death he celebrated his 21st birthday by telephoning his parents from Vietnam. He is survived by his parents, Mr. asnd Mrs Frederick Reid (sic); three brothers, Thomas, Kenneth and Fred, and two sisters, Frances and Suzanne. All are of Miami. Rosary services will be at 8 p.m. Friday at the Bennett and Ulm Chapel. Friends may call at the chapel today, 7 p.m. until 9 p.m. and Friday 2 p.m. until 5 p.m. and 7 p.m. until 9 p.m.
Burial at Vista Memorial Gardens will follow a requiem mass at 11 a.m. Saturday in the Holy Family Catholic Church.